Stephen Petrina & E. Wayne Ross, Vancouver Observer, October 7, 2016– Vancouver, the city of disparities, is faced with polar opposites in its educational system. 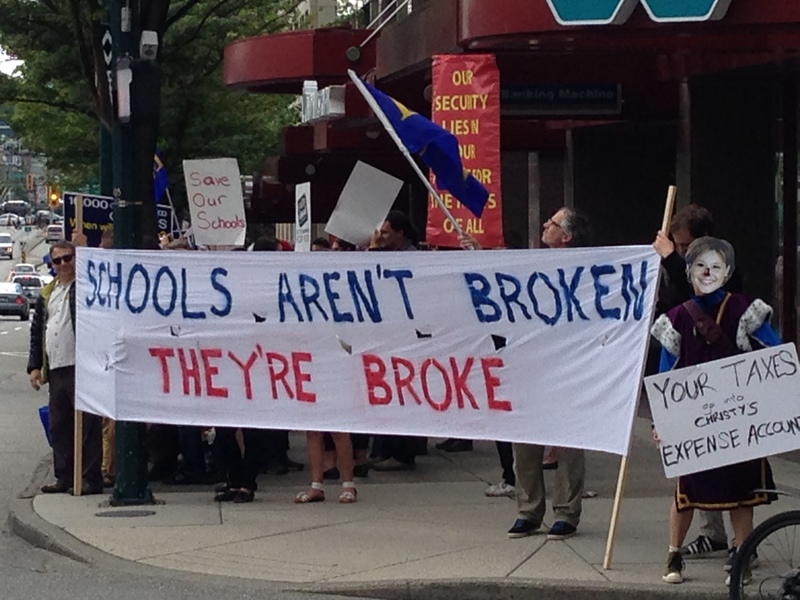 The contrast between K-12 schools and the university in Vancouver could not be more stark: The schools sinking in debt with rapidly declining enrolments and empty seats versus the university swimming in cash and bloating quotas to force excessive enrolments beyond capacity. With central offices just 7km or 12 minutes apart, the two operate as if in different hemispheres or eras: the schools laying off teachers and planning to close buildings versus the university given a quota for preparing about 650 teachers for a glutted market with few to no jobs on the remote horizon in the largest city of the province. There is a gateway from grade 12 in high school to grade 13 in the university but from a finance perspective there appears an unbreachable wall between village and castle. 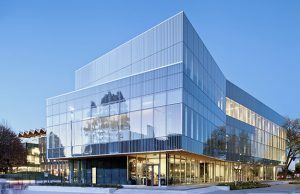 Pundits and researchers are nonetheless mistaken in believing that the Vancouver schools’ current $22m shortfall is disconnected from the university’s $36m real estate windfall this past year. The schools are begging for funds from the Liberals, who, after saying no to K-12, turn around to say yes to grades 13-24 and pour money into the University of British Columbia, no questions asked. There may be two ministries in government, Education and Advanced Education; there is but one tax-funded bank account. 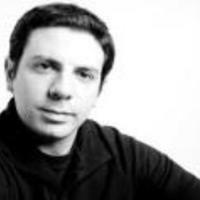 “School reform” has a very bad reputation among left thinkers and activists for some very good reasons in the neoliberal era. Captive to corporate-backed school privatization activists, contemporary “school reform” sets public schools, teachers, and teacher unions up to fail by blaming them for low student standardized test scores that are all-too unmentionably the product of students’ low socioeconomic status and related racial and ethnic oppression. Its obsession with test scores assaults imagination and critical thinking, narrowing curriculum and classroom experience around the lifeless task of filling in the correct bubbles beneath droves of authoritarian multiple-“choice” questions crafted in distant, sociopathic corporate cubicles. Students become passive recipients of strictly limited information deposited into their brains by teachers who “are prevented from taking risks and designing their own lessons as the pressure to produce high test scores produces highly scripted and regimented” pedagogy, wherein “worksheets become a substitute for critical teaching and rote memorization takes the place of in-depth thinking” (Henry Giroux). Pupils are rendered incapable of morally and politically challenging – and envisaging alternatives to – the terrible conditions they face under contemporary state capitalism and related oppression structures outside and inside schools. But what if “school reform” meant the empowerment of radically democratic educators who sought the opposite what Carlin’s business owners want – and more? What if those teachers were dedicated to helping future citizens and workers become sufficiently smart, inspired, confident, courageous, loving and solidaristic, not only to understand what the capitalist owners and their coordinators are doing to society and life itself, but also to resist those elites and to create an egalitarian, democratic, sustainable, peaceful, and truly human world turned upside down? Such teachers wouldn’t think that schools could bring about such a revolutionary transformation on their own. They would, however, understand “how,” in the leading left educational and social critic Peter McLaren’s words, “schools are implicated in social reproduction…how schools perpetuate or reproduce the social relationships and attitudes needed to sustain the existing dominant economic and class relations of the larger society.” Determined to interrupt and overturn that deadly reproduction, they would grasp the “partial autonomy of the school culture” and the necessity of occupying that space as “a vehicle for political activism and creating a praxis of social equality, economic justice, and gender equality” (Life in Schools, 150). “…in what Antonio Gramsci called a war of position – a struggle to unify diverse social movements in our collective efforts to resist global capitalism – in order to wage what he called a war of maneuver (a concerted effort to challenge and transform the state, to create an alternative matrix for society other than value). Part of our war of position is taking place in our schools. Schools form part of Gramsci’s integral state as a government-coercive apparatus and an apparatus of political and cultural hegemony that continually needs to be renewed in order to secure the assent of the dominant group’s agenda.” (Life in Schools, 245-46). Building on stories from his early years as what he considers a rather naïve liberal teacher in an inner-city Toronto school, McLaren takes his readers on a long and loving trip from his years in the classroom (Life in Schools contains a previously published journal [titled Cries From the Corridor] in which McLaren recorded his teaching experience prior to his engagement with radical theory) through the theory of revolutionary critical pedagogy; the roles that mainstream schools and educational doctrine play in subjugating working class and minority students; the structures and ideologies of contemporary oppression and inequality (class, race, gender, ethnicity, and empire); and methods for teachers to instill students with confidence, hope and capacity for resistance and solidarity. What fundamental problems remain after a “settlement” has been reached? 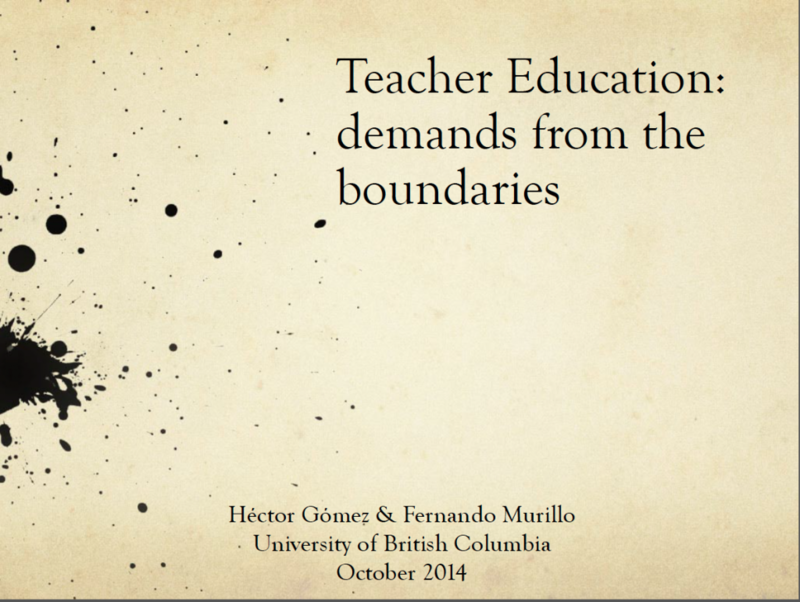 Should these problems affect the curriculum and pedagogy of courses in the UBC Teacher Education program? To this department conversation we encourage faculty to bring with them one or two of their degree candidates, those having written comprehensive exams or in the process of so doing. Tobey Steeves, October 26, 2014, Workplace— The 2014/2015 school year had a rocky start in British Columbia, Canada, where teachers and the ruling government have been locked in a contest over the future of public education in the province. Teachers finished the 2013/2014 school year locked out and on strike, and neither the teachers nor the government appeared willing to concede defeat. This clash between public and private values offers meaningful lessons for friends of public education. The struggle over maintaining public services is not unique to British Columbia (BC), of course, and Naomi Klein’s (2007) notion of shock doctrines provides a lens for understanding how and why public services around the world have been attacked and subverted via [manufactured] ‘crises’. In The Shock Doctrine: The Rise of Disaster Capitalism, Klein argues that shocks and disasters can disrupt societies’ “ruling narratives” and can – if given half a chance – be turned into opportunities for profit-grabbing and corporate re-structuring. Klein provides numerous examples from around the world to show that shock doctrines have been managed and cultivated in order to create “orchestrated raids on the public sphere” (p. 26). Klein’s analysis can be extended to BC, where the provincial government has nurtured the spread of privatized education – at the expense of public schools. CBC, September 16, 2014– A tentative deal has been reached in the months-long B.C. public school teachers’ strike, but the final details still have to be worked out, mediator Vince Ready confirmed this morning. 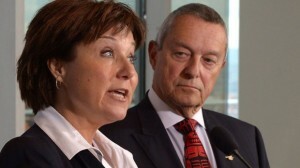 The breakthrough in negotiations between the B.C. Teachers’ Federation and the B.C. Public School Employers’ Association comes on the fourth day of marathon talks at a Richmond, B.C., hotel. No details about the deal will be released before it is finalized, said Ready, who emerged from the hotel to confirm the tentative deal shortly after 4 a.m. PT. The BCTF first tweeted that a tentative deal had been reached around 3:50 a.m. A few minutes later, Ready told reporters both sides would be meeting again later Tuesday to finalize the details. BCTF President Jim Iker announced this morning that the union’s membership will vote on binding arbitration on Wednesday. This ‘Yes to binding arbitration’ vote is immensely important, as this will formally put the power of the union’s members behind President Iker’s request to the BC Government on Friday to move the stalled contract negotiations to binding arbitration. This also reaffirms the union’s pressures on the BC Government to bargain in good faith. 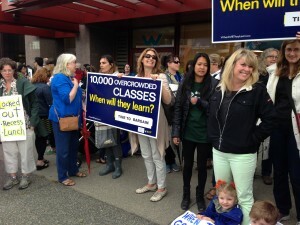 “It’s whal all teachers, students, and parents want,” the BCTF affirms. It is due time Premier Clark, to put the hard on again, and make two tough decisions: Fire Minister Fassbender and agree to binding arbitration to settle the contract with the BC Teachers’ Federation. Two tough decisions. Put the hard hat on. Premier Clark, how about firing Minister of Education Fassbender? And agree to binding arbitration. Put the hard hat on and make two tough decisions. Taking the high ground in a prolonged labour dispute, the BC Teachers’ Federation (BCTF) has requested binding arbitration. BC Premiere Christy Clark and Minister of Education Peter Fassbender have been counter-productive in agitating the teachers to suspend the strike. Feeling the pressures of sustained job action– the likes of which BC has not seen in a long time– the Premier and Minister have consistently underestimated the BCTF and made a series of awkward mistakes. 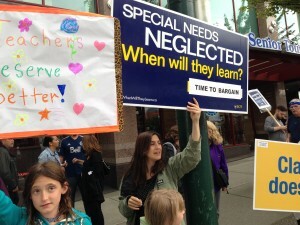 Now, here again is the BCTF taking the high ground and waiting for the Liberals’ response. 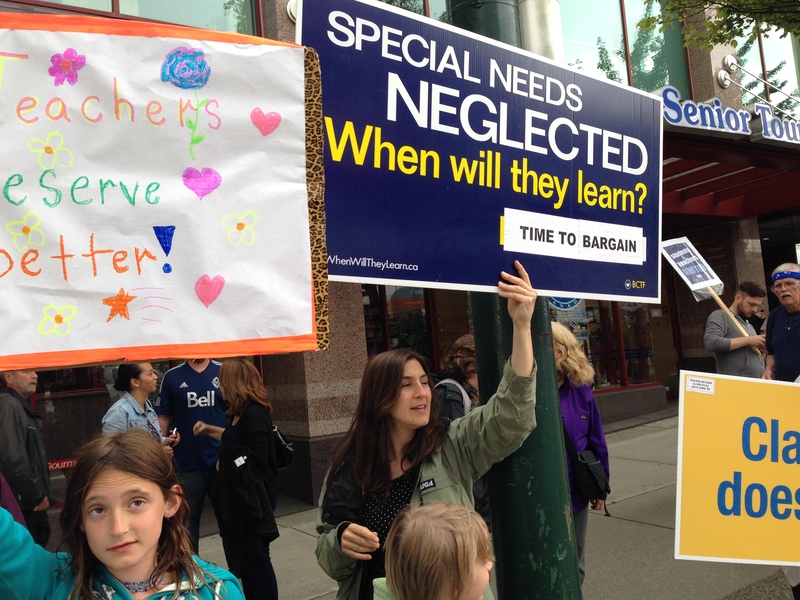 BCTF, September 5, 2014– Today, in an effort to find a fair settlement for all parties involved, open schools, and get children and teachers back into classrooms, the BCTF has called for binding arbitration. If the BC Public School Employers’ Association agrees to binding arbitration, the BCTF would quickly put the vote to teachers to end the strike. 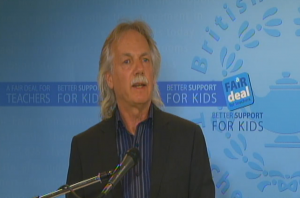 BCTF President Jim Iker made the announcement as teachers across the province gathered together for study sessions. His speaking notes (check against delivery at http://new.livestream.com/BCTF/Sept0514) are below. First, I want to speak directly to the 40,000 teachers watching around the province in today’s study sessions. Your determination, solidarity, and support move me every day. You have given up so much for your students and the future of BC’s education system. All British Columbians owe you their gratitude. Earlier this week, I outlined a simple, pragmatic, and practical way forward to ensure all parties involved reach a fair settlement so we can get schools open. I also said we would consider all options and close no doors. So today, I would like to open another one. Throughout this dispute, BC teachers have led the way in trying to reach a fair deal that gives our students more support. We have made moves, proposed creative ideas, and taken job action only when absolutely necessary. In return, the government has put up road blocks. Their focus has been on delay tactics, a $40-a-day payout scheme, and attack ads on Twitter. I hope that all comes to an end today. 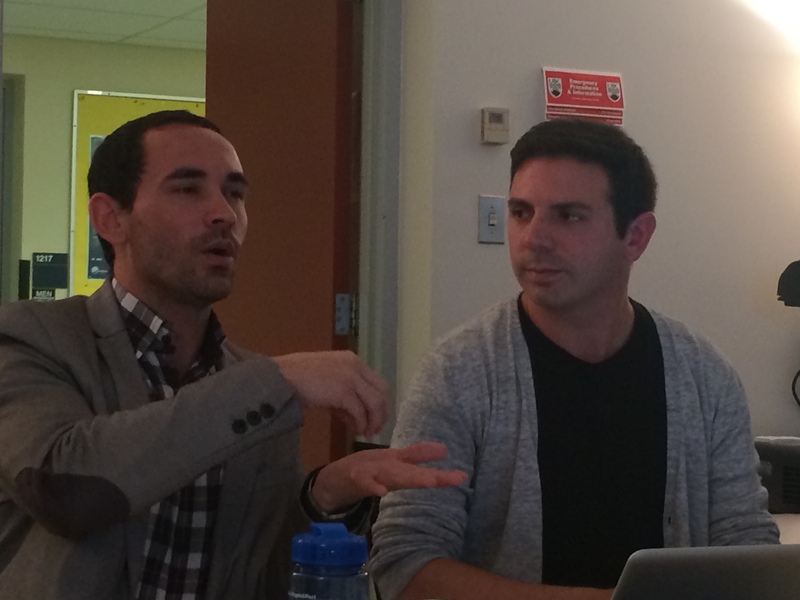 This week, the BCTF Executive Committee met with our provincial Bargaining Team and we are proposing another way forward to get students and teachers back in the classroom. Today, we are not closing any doors, just opening a new one. Mediation with Vince Ready in our view is still a viable option. However, BCPSEA and government made it clear last weekend that they were not ready or willing to get the job done. They did not respond in any meaningful way to any of the significant moves teachers made. Today, we are putting forward another option for all of us—government and teachers to resolve this dispute and reach a fair settlement. 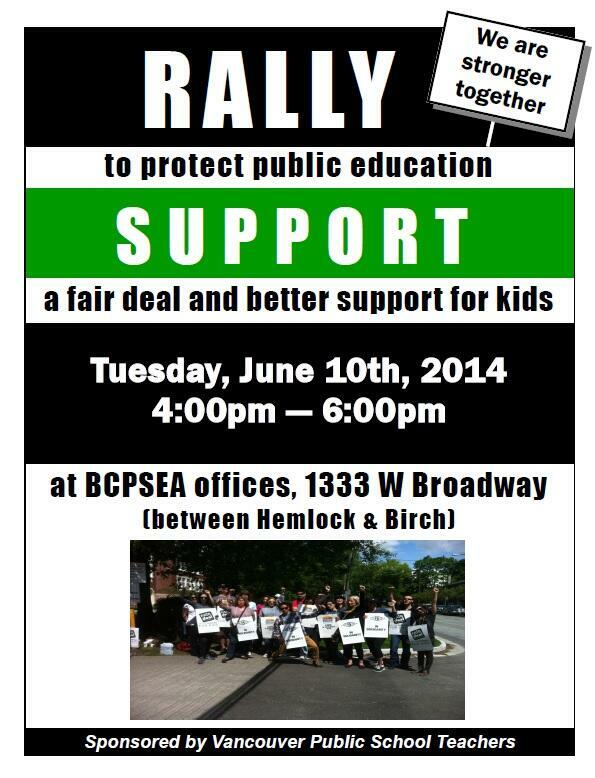 Today, the BCTF is calling on BCPSEA and the BC Liberal government to agree to binding arbitration. 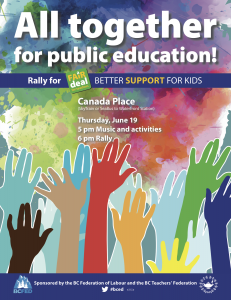 As leaders of British Columbia’s Labour Movement we speak with one voice today in solidarity with the 40,000 teachers in the province who are standing up for the rights of children to a quality public education by demanding a fair collective agreement. It is becoming more and more apparent that, despite statements to the contrary by Premier Christy Clark, there is little desire by the B.C. Liberal government to bargain in good faith and end this dispute for the good of all. The B.C. Teachers’ Federation has shown a willingness to find a path forward, putting forth significant changes that would have brought teachers and the employer closer to an agreement. But the government refused to even discuss them, and chose to move backwards instead of forwards. Teachers want to stay in the classroom but they know how important it is to hold strong against the government’s assault on our public education system. Their fight is bigger than one union – they are fighting for the rights of all workers to be treated with dignity and for all children to have a solid start in life. 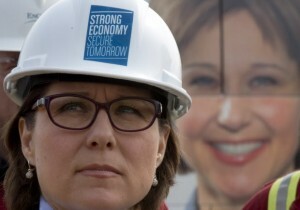 Christy Clark and the B.C. Liberals need to get the clear message from British Columbians that it is time for the government to respect the work of our teachers and the two court decisions, and negotiate a settlement in good faith. There is no need to let this dispute continue through the summer and into the fall. The time to settle is now. We know that workers and parents across the province support teachers – they understand and respect the important role they play in our communities. It is now time for all of us to take action. Demonstrations of solidarity with teachers are more important now than ever. As labour leaders and parents we are calling on our members, and all British Columbians, to bolster the picket lines to ensure teachers know they are not standing alone, and the government knows we are a united movement. Such acts of solidarity over the last two weeks have made a difference. Other unions, including 25,000 CUPE members, have been active on the picket lines – and as the teachers move into a full strike, we all need to play our part. Write the Premier, the Education Minister and your local MLA. Tell Christy Clark to stop wasting taxpayers’ money on fighting the courts, and start investing in public education so that our kids have the best chance for success. And join the rallies being hosted by the B.C. Federation of Labour and the B.C. 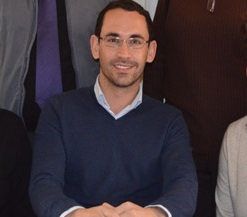 Teachers’ Federation. A strong showing sends a strong message – both to the teachers of the province who need your support, and to the government who needs to hear your frustration. As working people, public education has never been more important for our young people. Their success in finding meaningful work and in being active members of their communities is tied directly to a fully-funded public education system where all educational staff are respected. We are all responsible for protecting that system now. Thursday, June 19, 2014 – 6:00 p.m. The Officers of the BC Federation of Labour held a conference call today and pledged full support for the BC Teachers Federation who are now engaged in a full strike province-wide for a fair collective agreement. Today, we delivered a petition signed by 477 faculty members, librarians, administrators, students, and staff in post-secondary institutions across BC to Premier Christy Clark and Minister Peter Fassbender. Thanks you to all who signed! Comments made by signatories are extremely insightful and emphasize the widespread support of the teachers / BCTF. We will leave the petition open to reach another goal of 600 signatures. We the undersigned, faculty members, librarians, administrators, students, and staff in post-secondary institutions across British Columbia, encourage you to increase your support of public education by recognizing the value of our teachers. We encourage you to demonstrate this recognition by bargaining with the BCTF with an open mind to quickly meeting the teachers’ very fair proposals. 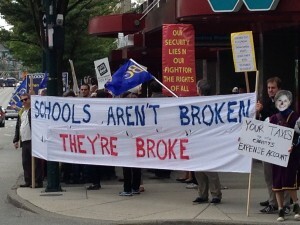 The BC Public School Employers’ Association’s (BCPSEA) retaliatory lockout further eroded the teachers’ right to bargain and threatened fair labour practices across the BC public sector. BCTF President Iker argues “It’s time for Premier Christy Clark to provide the employer with new funding that will help bring the two sides closer together on class size, composition, staffing levels for specialist teachers, and wages.” We agree. Please invest in education and labour by resolving this dispute at the bargaining table rather than through retaliatory lockouts and unrealistic proposals. Please meet the teachers’ most recent proposal for common ground. The teachers, who are the BCTF, and all public sector employees through their unions, deserve a fair, timely process of reaching a collective agreement. Thank you.